How To Safety Factory Reset Samsung Galaxy S3 (I9300) Format to Default ? When using smartphone sometime we get problem like hang or not responding in Samsung Galaxy S3 (i9300). This is very terrible because we can not use Samsung Galaxy S3 properly. In this manual, will talk about easy step to hard reset or format to factory reset Samsung Galaxy S3 (i9300). Please remember, when we decided to format Samsung Galaxy S3, the data and downloaded application will be removed and back to default application, that’s why we always suggest to make backup before doing the Factory Reset Samsung Galaxy S3. You do not need any code to force format Samsung Galaxy S34, just follow the simple step bellow. How to Erase and Format to Factory Reset Samsung Galaxy S3? #Option 1: Hard Reset Samsung Galaxy S3 with software Menu. When we choose Reset Phone, the warning will be appear and make sure you understand that all data will be erase or deleted. The data you have to backup before is : Contact / SMS / downloaded Application and others. When we can not access any menu at our Samsung Galaxy S3, something that we can do more is just pressing secret key to format hard reset Samsung Galaxy S3. Please do this step carefully because all data will be erase while doing this format method. Make sure our Samsung Galaxy S3 in off condition and the battery already in the position. Finish, all data will be removed and the Samsung Galaxy S3 will format by itself to factory default. This is another way to reset Samsung Galaxy S3 (i9300), but please be careful using special secret code, because some step will make Samsung directly reset without any confirmation, of course this will make your data suddenly remove or disappear. Please becareful using security secret code, your data will remove from your phone, think before you do this. When will We Need to Format Factory Reset Samsung Galaxy S3 ? Is It Safe to Format Factory Reset Samsung Galaxy S3? Is My Data Will Be Removed after Format Factory Reset Samsung Galaxy S3? What to do if I forgot Samsung Galaxy S3 Security Password or Pin or Screen Lock Code? You can try to use forget password choice in Samsung Galaxy S3 i9300 for login with Gmail account which already active in the SGS3, but if you can not access the Gmail account, unfortunately you have do the hard reset or restore Samsung Galaxy S3 i9300 to factory default with step above. [A] Hi, as far as your Samsung Galaxy S3 is not rooted or not use custom rom, then your phone still can reinstall factory default operating system with hardware button combination key. Please follow steps at #option 2 above to reformat your OS to factory default. [A] Hi, by default your Samsung Galaxy S3 Bluetooth and wifi will be active after you activate from menu Setting. If still can not work, then you have to do hard reset using menu Setting to reformat Samsung Galaxy S3 operating system to factory default, and usually it will fix Bluetooth and Wifi trouble if that situations happen because applications problems. The information from this page describe about i9300 hard reset,samsung i9300 hard reset,how to format s3,samsung s3 format code,samsung galaxy s3 format code,how to format samsung galaxy s3,hard reset i9300,how to format galaxy s3,samsung galaxy s3 i9300 hard reset,how to format samsung s3. If you need another resource for hard reset, use search function at this homepage or find from our related posts. How to Easily Master Format HUAWEI MEDIAPAD T2 7.0 (PRO) with Safety Hard Reset? How to Easily Master Format LG L80 DUAL (D380 & D373) with Safety Hard Reset? I tried he second option but it’s asking for password.. I failed to understand what password? I entered my google account password/fb password/all passwords I know but it said “sorry try again”. What password was it asking for? Hi, if you need to use speaker phone (to use speaker louder) then just press speaker icon when make phone call (receiving or calling). Do this after you already connected to other party. WHY? MY SAMSUNG S9300, DOES’T SHOWS PICTURE WHEN BROWSE JAVA. Hi, if you have problem with your browser, better try to use alternative browser like Google Chrome, it can be run well for specific applications. I have tried to format my S3, and now it’s stuck on samsung logo, what should I do? or for how long I should wait for it? Hi, in normal situation doing master format or hard reset will not take more than 10 minutes. If the process more that that time, maybe something happen with your phone or the phone bricks. Make sure to follow the step again carefully, if the problem still happen, you need to check your Samsung Galaxy S3 to Samsung service center for further test. Where do I type this Secret Code for Full Factory Reset: *2767*3855# ? Hi, you can type the secret code at Phone Dealer location. Hi, phone dealer available inside application menu if the shortcut not see in front desktop. You also can dial someone number using contact menu at your Samsung Galaxy S3. hi sir.. can i ask.. its about my samsung gt i9300 it has no signal .. how can i fix this signal ..??? Hi, first you need to make sure about the GSM card itself weather working normal or not, please try to use the simcard to other GSM phone to check it. If GSM card is ok, then put it again to Samsung Galaxy S3, and try to make sure the Flight Mode is not activated. The last try you can do is performing hard reset will reinstall factory default firmware or operating system and make all setting back to normal again. My samsung s3, I done factory reset and reboot. but i accidentally hard reset – formatted system. Now can’t switch on. only show the words ‘ samsung galaxy s3 GT-19300. Hi, doing hard reset is almost the same with doing factory reset. So, in normal situation your Samsung Galaxy S3 should work normal although you accidentally doing hard reset again. Please try to do format or hard reset one more time using hardware button key. i received a software update from samsung for my SGS3 but after it was installed it reboot but didnot open to normal screen; i mean it hanged at samsung logo part; i tried to do hard reset but it again hang at same part. Do you have any solution? Thank you. Hi, usually at normal situations, we can update the official firmware or operating system for Samsung Galaxy S3 with software Menu > About. We have to know, that the upgrade process only available or can work normally if our phone still not root or never get the unofficial firmware. If you never do unofficial procedure to update, but you still get problem for upgrade the official firmware, then you should bring to authorize Samsung service center for their help. 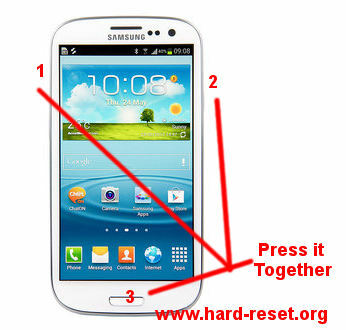 Hi, there are several options that you can do for doing hard reset or master format at Samsung Galaxy S3. Some options maybe can not work during trouble in our phone, but usually hard reset with hardware button will work. If you still can access software menu, doing hard reset with Setting Menu > Backup & reset > Factory data reset also recommended. I set my galaxy 3 to manufacturer’s default and totally wiped out the operating system. All I get is the AT&T icon in the center of white screen. How to reload or reset the operating system? I appreciate any help…. Hi, basically the operating system file source already available at your Samsung Galaxy S3, if you are doing hard reset using standard steps above, then usually the operating system will be reinstall although all data will be wipe or remote. However, this standard steps will not working properly if you ever do some tweaking or root or using custom ROM. That is why you should make sure your phone at standard non root default os or not. If you are sure, please try to do again hard reset but you have to use hardware button like steps at #Options 2 above. Hi. I accidentally punched the code for full factory reset on my galaxy s3 and lost all data. Please help me recover it. Hi, unfortunately we can not restore erased or wiped data at internal memory. Although you will find several recovery applications from Google Play Store, but in the real usage, it will mostly to hard to recover. However, you can try to download that apps and try by your self. does this code function well on S3 and update the software also to 4.4? Hi, you can test it, but the secret code for hard reset still work at latest version of firmware. Hi, after doing hard reset and erase all data at all storgae, it is very small possibility for us to recover old data at internal memory. However, for safety reasons, please do not give your external microSD to new user when you want to sell your phone. Better you buy new microSD if you want to sell include with microSD card. Hi, My Samsung galaxy S3 GT-19300T doesnt start, it just show the logo of Samsung when i switched it on. I tried my level best to do factory reset but the problem still exist. Hi, if you already try to do hard reset but the problem still happen at your Samsung Galaxy S3, then there are several possibility that can make it happen, first you have to make sure your Samsung Galaxy S3 still at standard rom without Root or Custom ROM or any other tweak. Because hard reset or standard solutions will not work with it. If you are sure that your phone still never get any custom tweak, then you have to consult with Samsung authorize for hardware troubleshot. sir i cant format my s3? what will i do? i want to format because it’s not swping and the screen was locked. Hi, if you forgot the screen lock protection at Samsung Galaxy S3, then you can try to unlock or bypass using Google account that you have already signed in before. Please try to give several time wrong answer continuously until your Samsung Galaxy S3 locked or freeze about 30 seconds, at this moment you will find Forgot Password / Pattern button, press this button, then you can give your Gmail username and password that you you have already signed in before. If you still can not unlock Samsung Galaxy S3 using Gmail account, then you have to do hard reset using hardware button combination key at #option 2 above. Hi my Samsung galaxy s3 19300 has not been giving me network signal.. I did factory reset but the problem is still there.even when i bought a new sim. It keeps saying NOT REGISTERED ON NETWORK. Please I need your advice on that..thanks. Hi, we are assume that your phone still at the same network provider which the frequency still can recognize with your Samsung Galaxy S3. Maybe there are some hardware trouble happen at your phone and need to get further check at Samsung authorize service center. Hi, usually this is because operator problems. You can try to use different simcard and test your phone to make a phone call again. Hi, at normal situations your Samsung Galaxy S3 will perform hard reset using hardware button combination key, unless your phone already get some tweak or rooted or use custom rom. The other alternative non standard procedure is flashing the firmware using ODIN but this steps is only recommended for some uses who know what they do. Hi, please try to make sure your Gmail username and password are correct. Please use computer browser and use https://mail.google.com to test your account. If you forgot about it, you can try to use Forgot Password facilities at Google homepage. If you still can not access Gmail account from your Samsung Galaxy S3, then please try to do again hard reset using hardware button combination key carefully. it automatically on by itself and with in a seconds when my main screen get opened at that time it will gets off. and even i tried to do hard format but it is not working when the android loge appears at that stage it gets off once again. Hi, sometime this problems happen because your power button hardware get trouble. Maybe because 3th party hard or soft case. Please do further check at Samsung authorize service center. Hi I really need some help I have cynogen mod 12.1 on my sprint Samsung galaxy s3 and I was wondering how can I change it back to normal as if I barely bought it? Hi, unfortunately we can not give good answer for rooted or custom rom of Samsung Galaxy S3, because many non standard possibilities error happen. Please consult with some member of XDA developers, maybe they can help you. But if you still can not fix that, please bring your Samsung Galaxy S3 to Samsung authorize service center. Hi, by default your Samsung Galaxy S3 Bluetooth and wifi will be active after you activate from menu Setting. If still can not work, then you have to do hard reset using menu Setting to reformat Samsung Galaxy S3 operating system to factory default, and usually it will fix Bluetooth and Wifi trouble if that situations happen because applications problems. Hi, as far as your Samsung Galaxy S3 is not rooted or not use custom rom, then your phone still can reinstall factory default operating system with hardware button combination key. Please follow steps at #option 2 above to reformat your OS to factory default.